Views under the Palm | johnmpoole.com: Which US too-big-to-fail bank are you using? U.S. banks enjoy 'too-big-to-fail' advantage: Fed study | Reuters: "A landmark study by Federal Reserve economists found that large U.S. banks enjoy a "too-big-to-fail" advantage in financial markets, joining a heated debate that could influence regulators that are implementing tough new rules for Wall Street. The series of research papers, published on Tuesday by the U.S. central bank's influential New York branch, suggests the biggest banks benefited even after the financial crisis from lower funding and operating costs compared with smaller ones . . . ."
Too big to fail - Wikipedia, the free encyclopedia: "....The number of U.S. commercial and savings bank institutions reached a peak of 14,495 in 1984; this fell to 6,532 by the end of 2010. 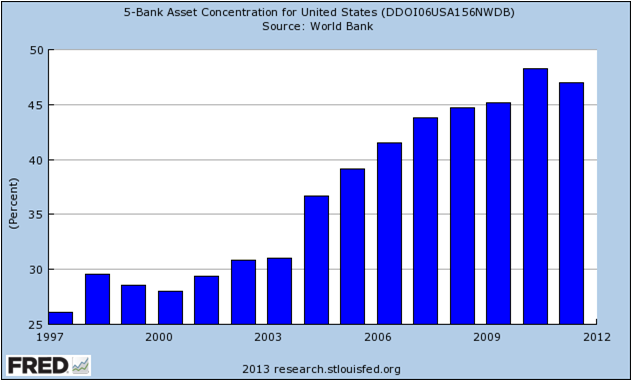 The ten largest U.S. banks held nearly 50% of U.S. deposits as of 2011. Implicit guarantee subsidy...."
Nothing like having a government sponsored, government guaranteed business!